Weight Watchers newest crop of celebrity endorsers differ from Oprah in one key aspect. Here's why it matters. Weight Watchers International (NASDAQ:WTW) caught lightning in a bottle with its Oprah Winfrey partnership. Since the media mogul took a 10% stake in the company in 2015, shares have exploded on the back of increased membership growth as Oprah has helped reposition Weight Watchers from a weight-loss program to more of a lifestyle brand. Understandably, Weight Watchers is looking to recreate lightning in a bottle while expanding its demographic reach. More recently, the company has announced a host of celebrity partnerships. Analysts at JP Morgan feel this is a wise move, raising Weight Watchers stock's target price on the company to $105, more than 1,450% higher than Oprah's entry price. Will Weight Watchers' subtle approach to men work? Doubling down on the concept of making partnerships with celebrities like Winfrey, Weight Watchers is wisely adding more influencers. During the last conference call, the company noted its stable of influencers included artist DJ Khaled, chef Eric Greenspan, and actor and director Kevin Smith. What's notable about these partnerships is that the celebrities are men, possibly helping the company to shed the perception it's a woman-only organization as market-research firms peg Weight Watchers' clientele mix at 85% women. For years Weight Watchers essentially ceded the male demographic to other diet plans like Nutrisystem, which it aggressively pursued using a host of former athletes as pitchmen. During last-quarter's conference call, CEO Mindy Grossman discussed this approach subtly, referring to these new influencers as being able to reach and inspire "a broader set of cohorts." Unfortunately, Grossman declined to address specific questions about the male mix of consumers and noted a splashy announcement for Weight Watchers for Men is "not our strategy." Due to the tremendous share price increase, Weight Watchers stock is no longer the value it once was. In early 2017, shares traded hands for a little as eight times consensus forward earnings. Shares of the company are now valued at 34 times forward earnings estimates, approximately 25% higher than the typical multiple for the small-cap Russell 2000 index. It's not that the company hasn't been growing both revenue and earnings per share: Those figures have increased 12% and 328%, respectively, since 2015's nadir. However, the stock price and market valuation have increased faster. Management has set lofty goals for the next few years. Weight Watchers is now targeting $2 billion in revenue by 2020, 15% per year higher than the $1.3 billion reported last year. 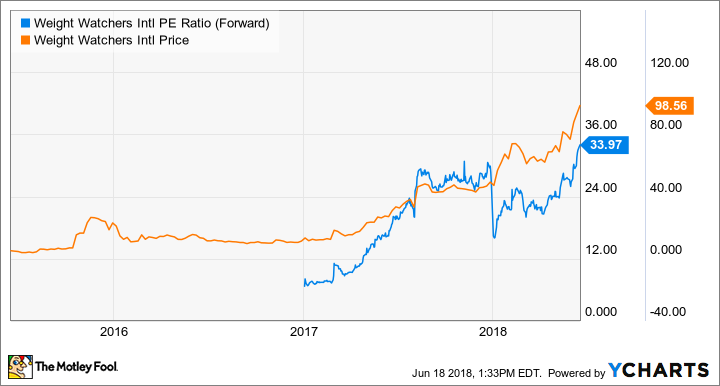 Additionally, the company increased its full-year EPS guidance to $3.10 at the midpoint last quarter; earnings beats and raises will need to continue for the company to keep its premium valuation. My opinion is Weight Watchers is wise to increase celebrity partnerships to grow its membership, and I'm encouraged that the company is looking to grow male membership. But at some point, subtle approaches to reach men will need to become more overt.